Eggplant is a fruit we consume as a vegetable. Technically a berry, eggplant comes in a wide range of shapes and sizes, from spherical to cylindrical, and from tiny to enormous, from 2 to 12 inches in length. There are creamy-white, egg-shaped eggplants, thin Japanese eggplants, small grape-like green Thai eggplants, rosy pink and white striped eggplants and purple and white striped eggplants and most commmon in the U.S., pear-shape variety with a smooth, glossy, dark purple skin. Some of the more common varieties. The eggplant, a member of the deadly nightshade family, is a vegetable of dubious origin. 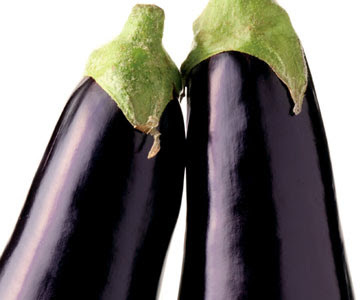 The origin of eggplant is disputed. Some say it originated in China some 4000 years ago, then was introduced into the Mideast by Arab traders in the 8th century. Others say it originated and was domesticated in India, then brought home by members of Arab armies in the 7th century. Others yet say it has been grown and eaten as a vegetable in Iran since 1500 BC. eggplant was spread by Arab traders through the middle east, into Europe and Africa. Europeans and Africans carried eggplants with them to the Americas. I love brinjal/eggplant. Whether it's baingan masala, baingan bharta ,baingan rice,baigankothsu or pitla. I make lots of varities with this vegetable. This one is a hit at my house. Fire roasted brinjals cooked with a simple combination of spices and herbs. 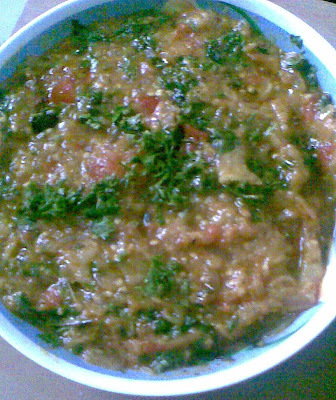 Every region in India has their own version of baingan bharta, this is one is from Northern India. Today’s recipe is vaangyache bharit very popularly known as “baingan ka bharta”all over India, but more specifically in the north of India, it’s called vankaaya pachadi in Andhra ,vaangya che bharit in Mahrashtra & yenne badnekayi in karnataka. The flavour of the roasted brinjal/egg plant is very unique it's authentically supposed to be roasted on coal . The dish goes well with bajri or rice bhakri or even naan,phulka & chapatti. On Stove: Hold the brinjal with stems over fire, to burn skin. When skin blackens, hold under running water. Gently scrub off skin. Mash brinjal to a puree. Heat oil in a heavy kadai. Add the cumin seeds and when they splutter add, ginger and garlic and stir fry for a minute. Add onions when they have turned golden brown add all dry masalas and salt stir fry for a minute more. Then add tomatoes, pureed brinjal, lemon juice and stir. Simmer for five minutes till everything is incorporated well. Just before serving, heat ghee in a small pan. and fry the red chillies in it and pour it over the bhurtha.Take it into a serving bowl. Garnish with chopped coriander.Serve hot with tandoori roti, paratha, etc. Baigaan barta looks gud..always like this one and I never knew eggplant is a fruit !! i love baingan ka bhurta .. smoked brinjals give an amazing flavour ..
Thankyou purva, sameera, priti, vegetable platter for sweet comments.